Memory Card required for DLC. Sold seperately. Cataclysmic Whodunnit! : Not only will players have to keep their eyes focused on strategically defeating the enemies laying in wait on the field of combat, but they need to carefully watch party members' tendencies in order to expose the traitor. 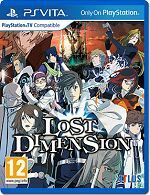 Spoiler-Free Zone: In addition to a variety of game mechanics to help assess teammate loyalty, Lost Dimension's traitor system is randomly determined, assuring that no two players will be faced with the same play through. Psychic Warlords: Each character in the party is a master of a different sphere of powers. There's the girl who controls molecular behavior to burn or freeze anything/anyone in her path. Keep Your Friends Close: In between battles, players will have the option to chat with teammates and develop closer bonds with them.